Gary Keller passed away in 1970 from injuries sustained in an automobile accldent. Gary was born Dec. 1, 1950 at Idaho Falls, the son of John and Thelma Hirschi Keller. He was raised in Terreton from 1950 until 1964 when the family moved to Idaho Falls. He attended Terreton Elementary School, O. E. Bell and Central Junior High Schools and was graduated from Idaho Falls High School in 1969. He was a member of the LDS Church. 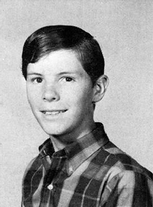 Gary was survived by his parents and brothers and sisters: Mrs. Dallas (Deanna) Bodily, Wayne Keller, Kent Keller, Mrs. Darryl (Kaylen) Sessions, all of Idaho Falls, and Rosalind Keller, Ricky Keller and Betty Keller of Mountain Home. Click here to see Gary's last Profile entry.